Ketogenic Diet for Migraine: Is it Working? But is the diet helping??? I inadvertently edited out the answer to the question many of you were wondering when I wrote about the ketogenic diet for migraine last week. The answer is a resounding maybe. I have not achieved my primary goals—eating or drinking anything but water still triggers a migraine attack and I still eat only once a day. But small improvements are increasing my quality of life. More responsive to migraine abortive meds: I still take Amerge and Midrin after every meal, but they are more effective than before starting the diet. I can usually function through the slowdown of early migraine symptoms that follow eating and sometimes barely feel the symptoms at all. One dose of Amerge and Midrin also manage some trigger foods that used to knock me out, but only if I eat them infrequently. I will soon experiment with taking Amerge sans Midrin after I eat. Decreased pain levels: My migraine attack pain is a level 3 most of the time. It still reaches 4 occasionally, but not as frequently as before. I’ve had one 5 since starting the diet. Five years ago, this would have felt miraculous, but pain hasn’t been my worst migraine symptom since 2013. Before the diet, level 4 pain was the norm and 5 was a little more frequent, but not substantially. Decreased fatigue: I am more functional during some migraine attacks. The improvement is minor. But I’ll take it given that the fatigue used to knock me flat. I also have less overall fatigue, which I’m guessing is because Amerge and Midrin are more effective. Improved cognitive function. Again, this improvement is minor but noticeable. A migraine attack no longer means I can’t write or read somewhat complex information. I can only write rough drafts and can’t translate journal articles. I can, however, get the gist of journal articles and have no problem with information for the general public, like press releases. Are you wondering why I’m staying on a diet that is causing me to lose too much weight and become malnourished, but is only kinda working? It’s because I’m not fully settled into the diet yet. Here’s why I’m sticking with it a little longer. The metabolism fully shifts from burning carbs to burning fat after three months of ketosis, according to my dietitian. Cellular and mitochondrial changes that happen at three months could impact my migraine attacks (for better or worse). April 15 is my three-month mark. I started the diet January 3, but wasn’t consistently in ketosis until the 15th. I’ve had a variety of issues implementing the diet and won’t be confident I’ve given it a good try until I’ve resolved them. The major nausea six hours I’ve gotten after eating every day for more than four weeks has been a huge burden. After working with two dietitians and my naturopath and trying numerous remedies, I think the issue is dehydration. Drinking 96 ounces of water a day is not enough; it looks like I need 128 ounces to stay hydrated on this diet. Then there’s malnutrition. My blood work keeps coming back with levels that are way off in different areas. In January, my liver enzymes were alarmingly high. They looked good in February. Now they are high again, but not as high as in January. That’s just one example, but any of these extreme fluctuations within my body could be triggering migraine attacks. Many of these things can be supplemented, but that’s another problem, which I’ll explain in the supplements section below. Zofran: The nausea has me taking 8 mg to 16 mg of Zofran a day. Normally I take 4 mg or 8 mg sporadically. It’s unlikely, but that increase could be increasing my migraine attack frequency. Adderall: When I tried increasing from 10 mg of Adderall to 20 mg in February, I became even more reactive to food. My migraine attacks lessened in severity and became more responsive to meds when I went back down to 10 mg. Last Monday, I stopped taking Adderall altogether. For the first few days, I thought my food reactivity decreased, but then it seemed to increase. After a few rough days, I resumed taking 10 mg yesterday. I’m still not sure what the ultimate verdict on Adderall will be, but I need to make it before I determine if I’ll stay on the diet or not. Supplements: Starting supplements to counteract malnutrition is likely an ever bigger factor than either Zofran or Adderall. Most supplements I try, even in very small doses, trigger migraine attacks that are unresponsive to medication. Another problem is that the preferred supplement to manage elevated homocysteine (my current blood work red flag) is 5-MTHF. That’s the supplement that triggered pretty severe depression the last time I took it to manage elevated homocysteine caused by malnutrition. 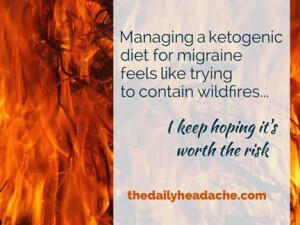 Managing a ketogenic diet for migraine feels like trying to contain a series of wildfires. As soon as I think one fire is under control, another part of the forest goes up in flames. Or the wind shifts and the fire I thought was contained flares up again. In a few weeks I’ll have to decide whether to keep fighting the fire or just walk away. So far, the improvements aren’t substantial enough to risk further malnutrition. But I keep hoping that after some of the fires are under control, I will feel better enough that the improvements are worth the risk.